Cream cheese is a fresh, or unripened, product made from cow’s milk. This is the Americanized variety, with similar versions marketed in Germany (Rahmfrishkase), Italy (mascarpone), and Austria (quark). A full-fat cream cheese contains 33% milkfat, which makes it a wonderfully smooth ingredient in cheesecake or when slathered on a bagel, crispy cracker, or celery stalk. The American version of cream cheese was developed around 1870 by a dairy farmer in New York. By adding cream to cow’s milk, he discovered a richer product that would become famous. Because Philadelphia, PA, bore a remarkable reputation for quality food products at that time, the first cream cheese received its name as a marketing tool. 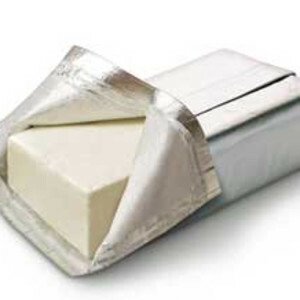 Cream cheese is sold in blocks or in tubs. It is available as full-fat, low-fat, and “light.” Neufchatel is a reduced fat cream cheese with a higher moisture content. Flavored cream cheese (herbed, peppery, vegetable, salmon, and fruity) is also available. A wider range of brands are sold in health food stores, including organic and gum-free products. Cream cheese can absorb odors. It should be refrigerated, even unopened, and tightly wrapped. Consume within two weeks, or no later than the “use by” date. Cream cheese is a must-have appetizer accompaniment. It can be mixed with herbs and spices or other cheeses and meats to create a multitude of toppings or fillers.